When my husband and I got married last year, we were also moving/cosmetically renovating our new home. Our Bachelor/Bachelorette weekends were both two weeks before the big day. So, we decided to have a delayed honeymoon, four months after the wedding, and it was the best thing for us. I think it’s a good idea for anyone who has a wedding plus one other major life event (such as buying your first house). When our fall wedding ended, I felt like I hit a brick wall. We had so much going on and then everything fell quiet. We really looked forward to the honeymoon as we took our time planning and enjoying the holidays as a newly married couple. So, off we went to.... Hawaii! I learned a few things along the way and wanted to share my advice with anyone who is planning a honeymoon. After deciding on a budget for your special trip, I think picking a location that suits your personality as a couple is important! David and I knew we wanted adventure mixed in with beach and rest. It suited my laid back personality and his go-getter style. But, we both love adventure so Hawaii gave us plenty to explore! Honeymoons can get expensive (I’m looking at you, Hawaii) but, be sure to have a few things on your list that you know both of you will enjoy! We decided to treat ourselves when it came to renting cars on each island. We got a jeep for the Big Island and a convertible for Oahu. David did most of the driving which he really enjoyed and I had fun taking the wheel from time to time but was happy riding along as his passenger. I mean, top down in Hawaii? Yes, please! 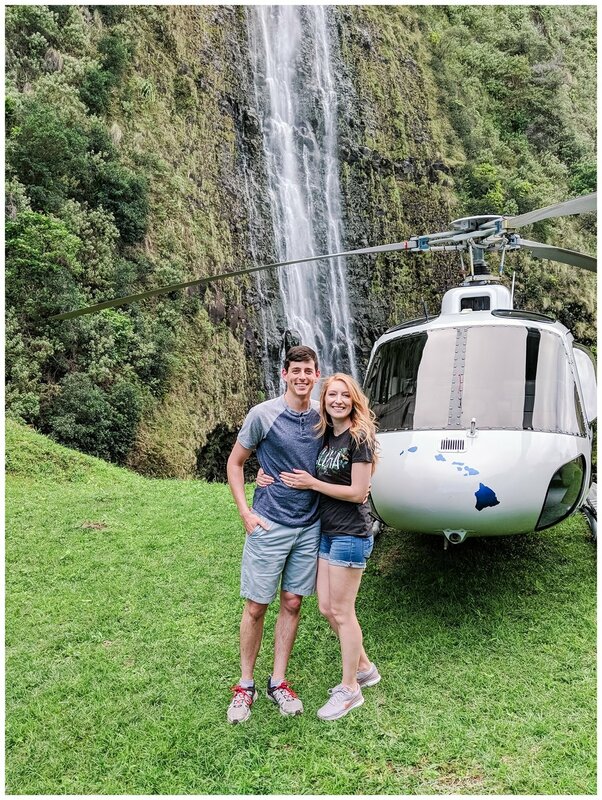 When David proposed to me in downtown Atlanta, it was right after we got out of a helicopter (you can see that story here) so when we saw that the Big Island offered helicopter tours we were very interested! We took a few days to think it over as it was not cheap. But wow, that was our favorite thing that we did on the Big Island. I’m so glad we went for it! Worth every penny. We skipped out on some other things in order to do that such as attending a Luau dinner. My best friend visited an all-inclusive in St. Lucia for her honeymoon and her advice is to splurge on a couples massage! I’m all about that life. You’re going to want your honeymoon to be romantic and as perfect as you imagine it to be but be prepared for the unexpected and the unwelcomed. In our case, delayed flights and food poisoning. So, be ready to roll with the unplanned and make the most of it. We flew to Hawaii from Atlanta which is a very long journey. We had to stop in Los Angeles, so we decided to buy dinner before hopping on the next plane. You probably already know this, but be sure to make smart food choices when stopping for dinner at the airport. David chose something better than I did (he always does) but I wanted a hot meal. I got food poisoning after the first day of our honeymoon. The silver lining is that it hit me at dinner time after we had spent all day sightseeing. I suffered through it all night and recovered the next day. That flight we were on at LAX was also delayed on the tarmac for FOUR hours. We were getting stressed and worried about our rental car company closing before we arrived. Luckily everything worked out, but we went to bed very hungry since nothing was open (and my airport dinner was horrible). We got up and ate the most expensive breakfast buffet I’ve ever had. Anyways, I wish I had packed my own food for the plane (more than just power bars). David took very good care of me though and everything turned out just fine! Tell anyone and everyone that it’s your honeymoon! You only get to do this once and people are happy to help you celebrate! Restaurants and hotels are especially great at this! Don’t leave your rings unattended in your room, unless you trust the safe in your room. But, also be careful about taking them into the ocean. David and I both have a set of rubber wedding bands. We have Enso rings and we love them! Another great brand is Qalo. David actually wears his Enso ring Monday-Friday at work and his metal ring on the weekends. The rubber wedding band is safer for people with a hands on job/dealing with machinery. This is advice related specifically to Hawaii (that I wish I had known about). Every restaurant requires a reservation. Otherwise, good luck eating before 9:30 pm or getting a table at all. So, each day I was on my phone in the morning searching for somewhere to save a table. I wish I would have planned for that/known in advance. I think it’s a great idea to unplug as much as possible when you’re on your honeymoon. Don’t post things to social media in the moment or feel like you need to make phone calls. I made a couple of posts with a photo or two during a wait between flights or a moment where we were relaxing. 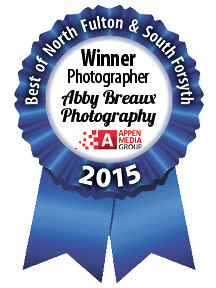 It’s exciting to share! But, being present is so much better. I think keeping a journal during our honeymoon would have been really neat! I took A LOT of pictures, it’s kinda my thing. I also didn’t take my professional camera. Which, sometimes made me feel lost but it was also very freeing. We had just bought ourselves the Google Pixel XL 2 (which have terrific cameras) so the cell phone photography was a welcomed challenge and helped me relax and be more present. We also booked a professional photographer which fueled my photographer heart with so much joy! With so many pictures happening during the wedding year, I thanked David a million times for going along with this idea and hoping back in front of the camera. We booked a session with Vanessa Hicks Photography on the North Shore of Oahu and it was so much fun! Highly recommend a photo shoot during your honeymoon to help document the trip. A few fun items to consider packing for your honeymoon! Items below are linked. Hubby and Wifey T-Shirts for the airplane. Beach Attire: Consider a white bathing suit, a new beach hat, go fancy! It’s your honeymoon. Everything But Water is my favorite! A fun handwritten letter to my hubby letting him know how excited I am for this new journey! So, if you’re jetsetting to Hawaii or are interested in what we did, read on! We visited two islands, The big island and Oahu. The big island is the largest and is officially named Hawaii. I read up on the big island before we arrived and the books suggested that you prepare yourself for its diverse terrain and don’t think of the big island as the “postcard of Hawaii” like Maui may be to most. With two active volcanoes on the island, its land is made up of so much contrast between lava rocks/bold plants and flowers. It’s amazing that there could be so much beauty in the path of destruction. 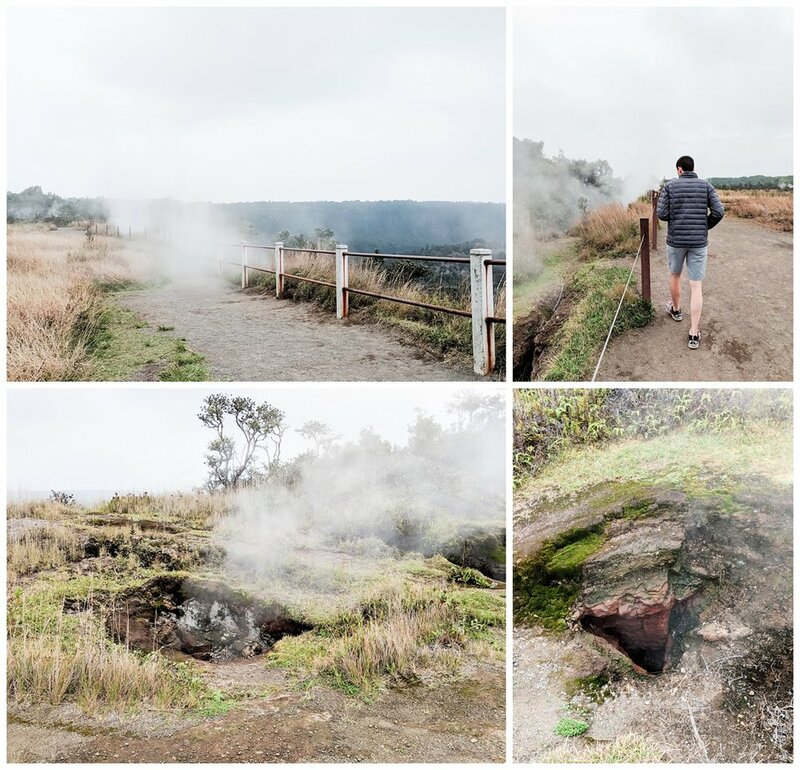 We visited the Hawaiʻi Volcanoes National Park and learned a lot about the activity/history of the volcanoes. One of the most interesting things we learned about was Pele’s Hair. Pele’s hair are thin, fragile strands of volcanic glass that form when molten lava escapes into the air during an eruption. It really does look like hair! Pele, is goddess of fire and volcanoes, according to the traditions of Hawaiian religion. 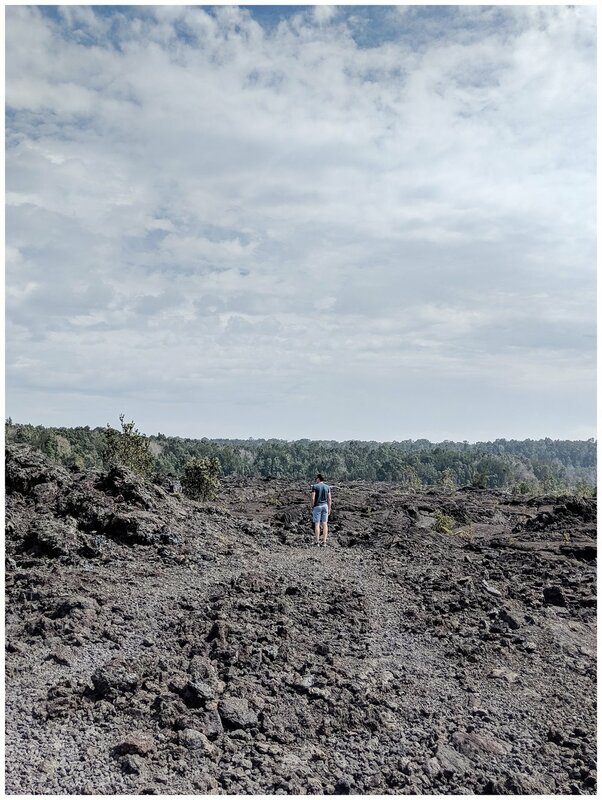 After our visit, the lava level in May 2018 in the Overlook Crater dropped over 700 feet and out of sight, resulting in explosions, earthquakes and large clouds of ash and toxic gas, causing closures in the park. 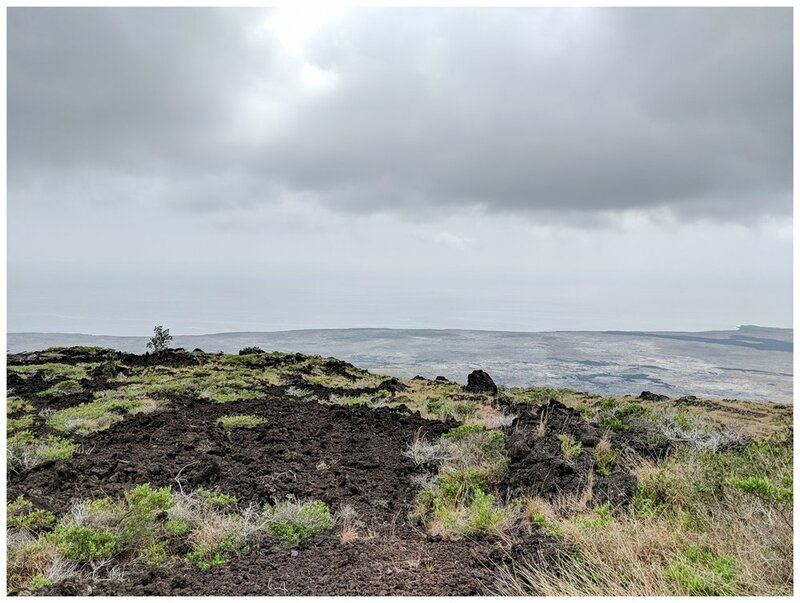 While the park visitor center and headquarters have reopened to the public, the crater at the Jaggar Museum, where we visited and learned about Pele’s hair, overlooking the crater remains closed. While we were there, David and I we were able to closely see and feel steam coming from the ground. Groundwater seeps down to the hot volcanic rocks in this area and returns to the surface as steam. The ground just a few feet down is so hot that tree roots can not survive. But shallow-rooted grasses and plants grow there. We hoped in the jeep and continued to drive through this massive park. We got out and explored different areas. It was chilly when we started and so hot when we drove towards the shore. You could spend days at this park! We had time to spend one full day and drove back to our condo for dinner. Known as one of the most beautiful beaches in the world! We relaxed with our books on the beach and explored the ½ mile area and the beautiful rocks along the shoreline. In the morning, the rays of sun are meant to hit the waterfall just right so that you are able to see rainbows! We saw a tiny one that morning at the base of the waterfall. We arrived a little later than we should have. It was very easy to get to and was a quick yet beautiful visit. The trees inside the forest just behind the waterfall were breathtakingly big! This waterfall required a short walk on a pathway through a jungle and once you arrive, the height of the waterfall is stunning. It feels a bit more touristy with the metal fence and crowds of people but it was worth the visit! We saw some beautiful flowers, plants and a curious lizard on our walk. During out waterfall visits, we stopped in this town for lunch at Hilo Bay Cafe and it was our favorite restaurant on the Big Island. We shared a parmesan crusted and roasted eggplant with red peppers, marinara sauce, basil-macadamia pesto on toasted rosemary bread. Yum! This restaurant had an amazing view too. After lunch we walked through, Liliʻuokalani Park and Gardens which is a 24.14-acre park with Japanese gardens. 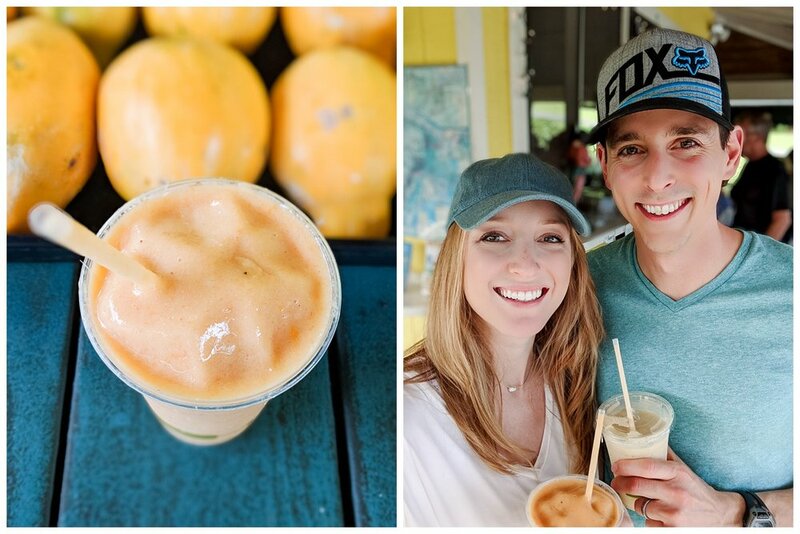 On our way back from Hilo and the waterfall tour, we found this shack called, What's Shakin' and they had the best smoothies! Thick and juicy with real fruit! I could go for one of those right now…We hopped back into the car and drove through a scenic route towards Onomea Bay, which provided beautiful views (with a delicious smoothie in hand). From a day of exploring waterfalls in shorts and a t-shirt we had to bundle up for this next adventure. Mauna Kea is a snow capped dormant volcano at 13, 082 feet above sea level, making it the highest point in the state of Hawaii. When measured from its oceanic base it’s the tallest mountain in the world (33,000 feet) but, most of the mountain is under water. It was really chilly up there! The sunset was beautiful and we felt high in the clouds. We sat on top of our jeep and watched the sun disappear into a burst of color on the horizon. David really enjoyed that visit. I wish we could have spent more time there. We ended our day at Kona Brewery for some pizza and beer. Coffee beer was one of the most interesting flavors we tried! The evening David proposed to me, we were journeying through the skies of Atlanta on a helicopter. So, we thought a helicopter tour on our honeymoon would be full of so many great memories! Before we began our ride, we enjoyed a healthy and colorful breakfast at the Under the Bodhi Tree. Hawaii is truly fruit heaven. Our pilot gave us a great experience and played the Jurassic Park theme song as we flew through the scenery where it looked like dinosaurs should be living. Our pilot even took us over the ocean to see some whales! The shot I got isn’t clear, but you can tell! We landed next to a waterfall during our tour and enjoyed some dessert and champagne. It truly was worth every penny to see the island this way! It was a 90 minute tour as well so we felt like we got a lot of good air time. We saw black and green sand beaches during our tour which was something we would not have had time to do by car. Thank you, Blue Hawaiian Helicopter Tour! One of the things that I love about Hawaii are the crowds that come together to enjoy a sunset at the end of the day. We saw some beautiful sunsets at Buddha Point and Kauna’o (Mauna Kea) Beach before leaving the Big Island. The day we arrived in Oahu, we hit the ground running. Almost literally. We only had two short days there so we made the most of it. We hiked not one but two mountains that day! Stairs. So. Many. Stairs. The steps leading up Koko Crater are old railroad ties that are mounted to the hillside from the bottom to the top. During World War II, the military created lookout pillbox bunkers. 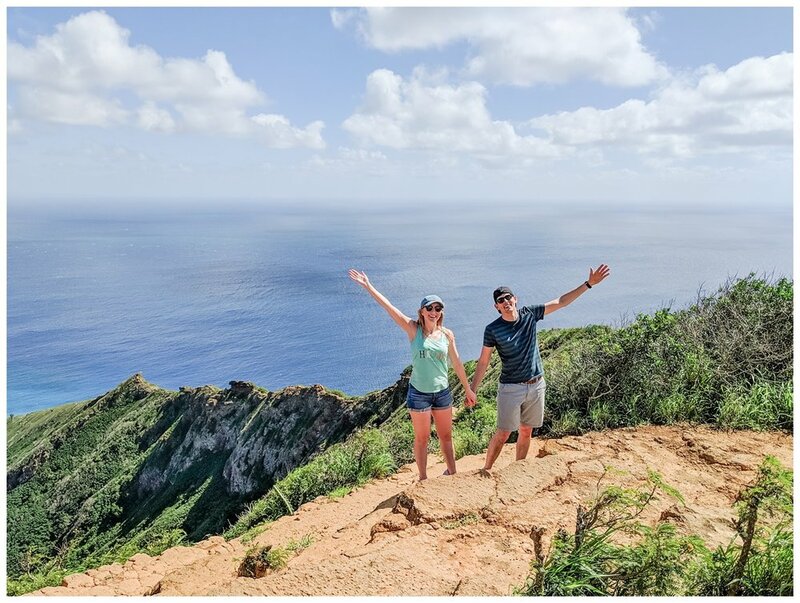 A railway was created on the Koko Crater trail, and used to haul cargo and supplies up to the top. Today, the abandoned railway is used as hiking stairs to reach panoramic views at the top. I did a lot of reading about this hike before we ventured up. I was nervous. People get injured and sometimes people don’t make it to the top and they turn around. With my husband in tow, we were going to conquer any mountain we attempted. As he frequently says, “let’s do this” So up and up and up we went. We passed many people coming and going. All different ages. As we got closer, it felt like we were on our knees making this steep climb, I was nervous! But after, 1,050 plus steps we made it to the top! My legs were shaking and my breathing was heavy but wow, it felt so good! The view is stunning and at times, it felt like we were the only two people up there. 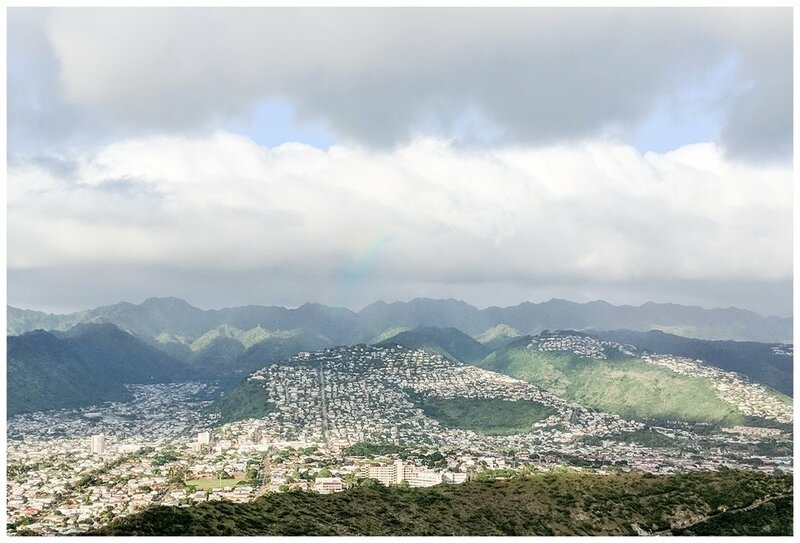 Diamond Head is still a ways up (560 feet) but a much easier hike than Koko Crater. 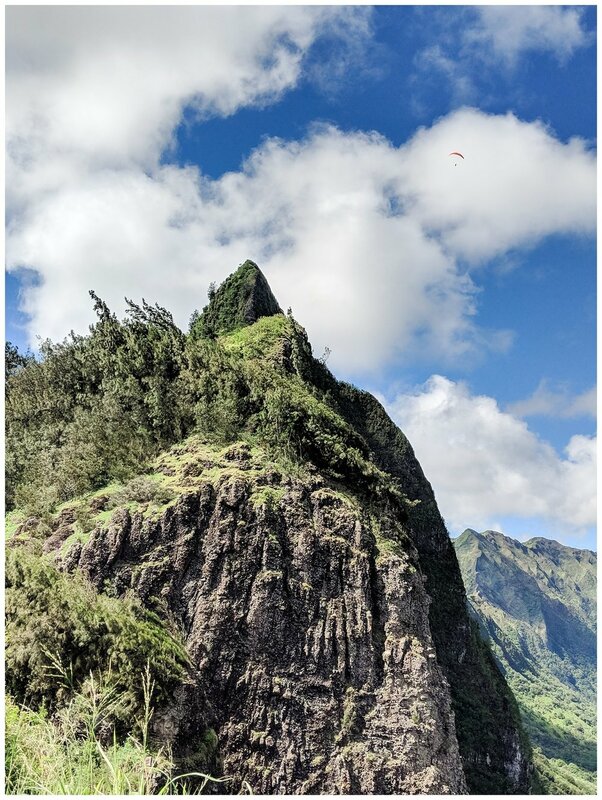 It’s the most recognizable landmark in Hawaii. This saucer-shaped crater was formed 30,000 years ago during a single, explosive eruption that sent ash and fine particles in the air. As these materials settled, they cemented together into a rock called tuff, creating the crater. The trail was originally built in 1908 by the US army and used for many decades as part of the Fort Rugur Military base. Artillery cannons, cement bunkers and an observation deck were built on the summit of the Diamond Head Crater. Today, Diamond Head has been turned into a state national park. I really enjoyed seeing the beautiful views of downtown from the top. We even caught a glimpse of a rainbow! This hike was much more packed and getting a picture at the top required patience and waiting your turn. David and I enjoyed the local feel of Koko Crater more. We drove for this stunning view and my legs were a little relieved after all that fun hiking! When you don’t have long to spend somewhere I believe in climbing (or driving) high to see all that you can! The views were incredible and we saw a hang glider too! What a view that must have been for that person in the air. But, this lookout isn’t just about great views. It has a lot of history. The Battle of Nu’uana occurred in the late 1700s. Kamehameha I from the island of Hawai’i sought to unite all the Hawaiian Islands under one rule. The battle for O’ahu began with the arrival of his forces at Waikiki in 1775. O’ahu had been defeated by Maui forces a decade earlier and Maui’s Chief, Kalanikupule was in charge. He was taken to this lookout and both sides fought but Kamehameha’s cannon led to his success of the battle. 400 soldiers died and were forced off the cliff (terrifying to think about when you’re standing over this lookout). With Kamehameha’s victory on O’ahu, he became the first king of the Hawaiian Islands. We couldn’t leave Oahu without visiting Pearl Harbor. Millions of people come to see for themselves where World War II began for the United States in 1941. We got up really early and arrived to secure our up walk tickets. It’s recommended to do it this way online and we’re really glad we did. They secure 1,300 tickets but they go quickly. As the day went on, it got more and more crowded. There are free tours to the USS Arizona Memorial every 15 minutes which also includes a very heartfelt documentary film. After viewing the film, we boarded a US Navy operated boat which took us to the Memorial. The entire morning, David and I were very quiet, reflecting on what had happened there so many years ago, but never forgotten. We took a shuttle from Pearl Harbor to the Aviation Museum at Ford Island. My husband is very passionate about aviation so this was a good visit for us. We saw a hanger where World War II-era planes live including an actual Japanese Zero and Stearman N2S-3 once piloted by former American President, George H. W. Bush. A bride of mine and her mom suggested a restaurant that David and I had to try. It had a unique name, so I didn’t forget it! Luckily, I remembered about the restaurant the day we landed in Oahu and made reservations that morning. I didn’t catch a reservation at sunset so it was dark when we arrived, but we still had a wonderful time of course! The restaurant is called, House Without a Key and it was beautiful, delicious and fancy! Our fanciest meal during our trip and so worth it. It sits along the water and they play live music. I got a flower in my drink which I just love! The next night we visited, Karai Crab which is tucked in the city. Upon walking in, it doesn’t appear to be anything special, but once you walk outside it’s like a secret oasis in the middle of the city. Definitely sit outside. David and I ordered these big bowl of crab legs (with giant bibs and all) and they were so delicious. We got free ice cream since it was our honeymoon! Shrimp trucks are quite popular in Hawaii and our photographer, Vanessa suggested that we take a drive and try Giovanni's Shrimp Truck. While we were there we also drank a coconut, which we ate afterwards, yum. We also tried some rambutan during our walk around Turtle Bay Resort. If you love toffee, you gotta try this! We love it so much, we packed some in our bags, ate it all when we got home and ordered more online. It’s called the Hamakua Toffee Company. It’s family owned and handcrafted on Hawaii’s Hamakua Coast. I’m really happy with the way our honeymoon album has turned out using only a cellphone, but I am very thankful to have turned the job over to the talented Vanessa Hicks Photography and get some professional shots of the two of us to help document our honeymoon. I highly recommend it! Thank you so much, Vanessa!! We enjoyed our time with you! Mahalo, Hawaii! Hawaii’s culture is rich, vibrant and treasured by so many. 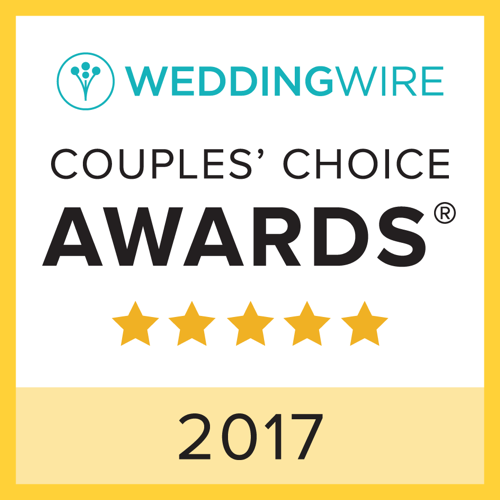 We feel so lucky to have experienced it together and if you are planning a trip to Hawaii, I hope this helps! And if you’re in the middle of planning our own honeymoon, remember that no matter where or when you go, the goal is to enjoy this special time together. Make new memories, be a team, seek adventure and know that this is only the beginning of your new and beautiful journey together as Mr. and Mrs.